Cuisine Kathleen: Tablescape Thursday..Garden Themed luncheon.. I am joining Susan from Between Naps on the Porch for Tablescape Thursday. 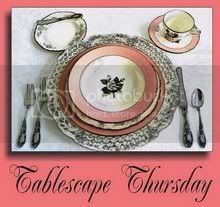 Please stop by her blog to see the other tablescapes. Today I am sharing a Garden themed luncheon table I did . A friend of mine was moving, so it was in her honor.. I placed New Guinea Impatiens in a wooden picket fence planter I had, and individual ones in picket fence holders, which were originally candle holders..
Aqua stems..and little ceramic pails to hold the flat breads..
A packet of garden themed note cards wrapped in floral paper as a take home. I only took one picture..It was before I was into blogging! 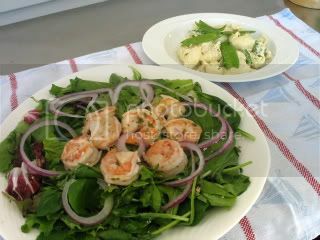 The main course was spinach salad with grilled shrimp, and chicken salad with pasta shells and snow peas..
Don't forget the Mother's Day tribute at Follies Follies..you are all invited..Mr Linky will be up tomorrow night.. Thanks for your comment on my "outdoor" post, but Annie's picture is still there -- second one from the last. Hmm, don't know why you couldn't see it. She's camera shy but she doesn't have magical powers to make her pictures disappear -- even though she probably wishes she does! Are you drying out on the East End? Love your pics from the North Fork -- you are torturing me! Cool photos, love what you have done with your pretty little tablescape, all those details do add up to a fabulous occassion. Thanks for sharing. Kathleen, I really love those centerpieces in the picket fences! Were the impatiens potted? Beautiful photos of the food as well and death by chocolate sounds wonderful. Kathleen, love that pretty garden tablesetting! Food looks great too. 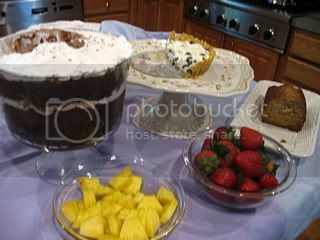 I added my name to follow, as I have been reading your blog for months...and just now started to blog myself...I love your recipes and how you display your pictures ! a visit and thanks for sharing ! Kathleen, Pretty in Pink ... gorgeous tablesetting ... I'm sure your friend was pleased. I love New Guinea impatiens, such rich colors. Deserts look good, but the shrimp and chicken salad really appeal to me. They look and sound delicious. Beautiful, Kathleen! I know your friend must have felt very special to have such a lovely luncheon in her honor! The food looks amazing! 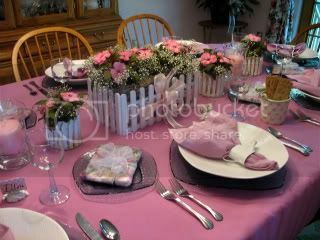 Love all the pink, and the picket fence centerpiece..clever idea. What a lucky friend to be treated so special.. I love your picket fence centerpiece. Happy Mother's Day.....have a beautiful weekend.